Perry (Hoot as he was known to his friends) was born on January 18, 1929, in Florence, Kentucky to Andrew Jackson Renaker and Rosa Mae Renaker. 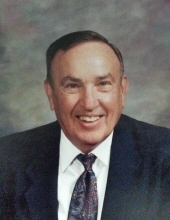 Perry passed away and joined our Lord in heaven on February 4, 2019, and was preceded in death by his wife, Helen C. Renaker. Perry attended and graduated from Florence High School. He lived his entire life of 90 + years in the city he loved, Florence, and was extremely proud of his community, Boone County and the State of Kentucky. He was a true Kentuckian. Perry retired from his position as a Supervisor for Cincinnati Gas & Electric at the age of 57, taking pride that he assisted in delivering power to the Tri-State area and made many lifelong friends among the crews he mentored. Perry loved the outdoors, was a superb athlete, playing both baseball and basketball. His favorite sport was baseball and he used this skill to cofound the Boone County Knothole Association-League. He enjoyed coaching and teaching baseball to a multitude of young men, many of whom he remained in contact with until the end of his life. During his retirement years he could often be found on the golf course. He enjoyed watching the Cincinnati Reds & Bengals and the Kentucky Wildcats. Perry was an avid story teller often using his knowledge of the local area to capture his audience with his humor and wit. Perry could spin a yarn. He was a wonderful Father and Grandfather. Perry is survived by his daughter, Vicki Thomas, his son, Perry David Renaker & wife Jean W. Renaker, his grandchildren, Brett Perry Ballantyne & fiancée Brittany Ann North, Veronica Camille Renaker & Richmond Garner Renaker. A Celebration of Life-Memorial Service will be held at the church he loved so much, Hopeful Lutheran, 6430 Hopeful Rd., Florence, Kentucky at 12:00 PM, Saturday February 16, 2019 with a reception immediately following. In lieu of flowers, please make any donation to the Boone County Historical Society. To send flowers or a remembrance gift to the family of PERRY GARNER RENAKER, please visit our Tribute Store. "Email Address" would like to share the life celebration of PERRY GARNER RENAKER. Click on the "link" to go to share a favorite memory or leave a condolence message for the family.